If you enjoy home cooking, the chances are that you really love sitting down to a meal with family and friends. Home cooking is the ideal way to add variety and interest to the family diet as well as ensuring that everyone is eating healthy, low calorie meals. Homemade meals use the freshest, healthiest ingredients, and foods that are in season. You can focus on using unrefined foods like brown rice and wholemeal breads, pastas and cereals; and you can avoid the additives and unhealthy trans fats that are in many processed foods. In Spring we welcome lighter dishes as a complete change from the warming recipes of Winter. Fish perfectly complements the first crop of new vegetables and this low calorie, healthy baked fish is ideal served with steamed new potatoes and broad beans. Preheat the oven to Gas mark 6 (200 degrees C). Remove any bones and place the fish on a baking sheet lined with baking parchment. Season with salt and pepper. Put breadcrumbs, garlic, chopped herbs and lemon zest into a bowl and mix well. Stir in the lemon juice and oil and season. Spoon the breadcrumb mixture on top of the fish, pressing it down well. Bake for about 12 minutes until the top is golden and the fish cooked. Serve immediately. This quick casserole dish is a complete meal and is a low calorie 270 per serving. For cooking you need a large ovenproof and flameproof casserole. Preheat the oven to Gas mark 4 (180 degrees C). Put the herbs and chicken into the casserole. Add onion, carrots, leeks, celery, potatoes and stock. Bring to the boil, transfer to the oven, and cook for 45 minutes until the chicken is ready. Add the beans, cooking for 5 minutes. Carve the chicken and divide among six plates. Spoon the vegetables on top and ladle the gravy over. 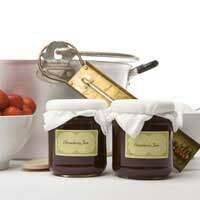 With the abundance of fruit and vegetables in summer, and with more and more people choosing to ‘grow their own’ where they can, it is very satisfying to preserve that seasonal goodness in jams and chutneys. It is essential to sterilise the jars. Do this by thoroughly washing in hot soapy water and rinsing well in boiling water. Turn them upside down to drain. Place them on a cooling rack, on kitchen paper, and heat in the oven at Gas mark 3 (160 degrees C) for 10 minutes until dry. Leave to cool. It is possible to sterilise jars in the microwave. Follow the manufacturer’s instructions for your model. You might find it useful to invest in a jam thermometer for accuracy in determining the setting point. A waxed disc and cellophane, secured with a rubber band, is the cheapest way to cover jams, jellies and marmalades. For chutneys and preserves containing vinegar you need tops that prevent evaporation. Twist-top lids, usually lined with plastic, are best. Surely one of the favourite recipes, this jam is easy to make. Use it for a home-baked Victoria sponge; and a spoonful is delicious served with fromage frais for a low calorie dessert. If necessary, wash and drain the fruit well. Place the raspberries in a large pan and simmer gently for about 10 minutes until they are tender and the juice is extracted. Remove from the heat. Add the sugar, stirring until completely dissolved. Put the pan back on the heat and bring to the boil. Boil rapidly for about 5 minutes and then remove any scum. Test for a set. Do this either by using the thermometer or,alternatively, using a plate which has been chilled, put a teaspoon of jam on it. Let it cool for 1 minute then push the surface of the jam. If it wrinkles the jam has reached setting point. Pour into cooled, sterilised jars then seal and label.